The Guide to Topanga is a full color, glossy, multi-page brochure that is not only delivered to every household in Topanga but is distributed far and wide outside of the Canyon to hotels, restaurants and other local venues. The Guide is published yearly and membership guarantees that you are listed in the directory printed inside. You may also purchase a single card-sized or double card-size ad. Details on what the Guide looks like can be found below. You will be notified of our publishing dates and print and size requirements when we start accepting advertisers for the next year’s Guide. The Topanga Guide is designed and printed by the Chamber of Commerce every year in the fall. 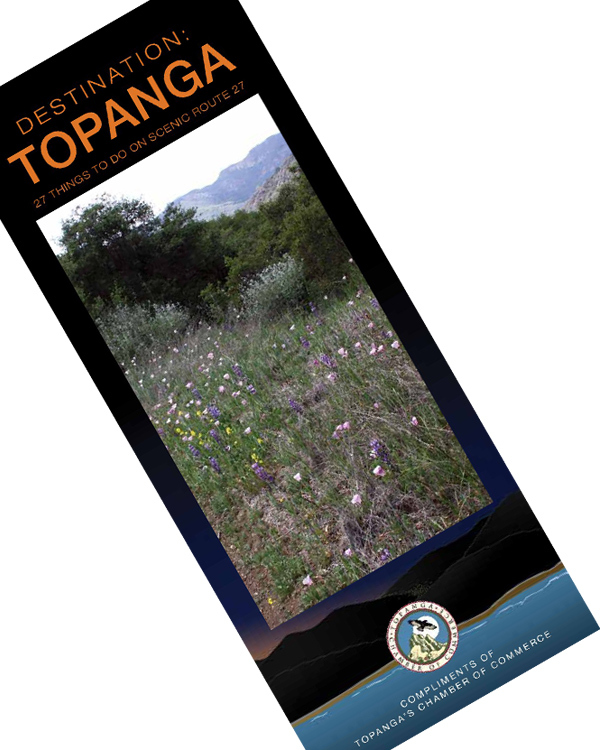 This year the theme was based on the Chamber’s marketing program for “Destination: Topanga, Where Nature, Community & Business Thrive Naturally.” One exciting addition to this promotion is the “27 Things to Do on Scenic Route 27”– a descriptive guide for visitors that explains the many ways others can enjoy and experience what this unique community has to offer. The 7,000 copies will be distributed throughout Topanga as well as to adjoining communities, businesses, hotels and restaurants.